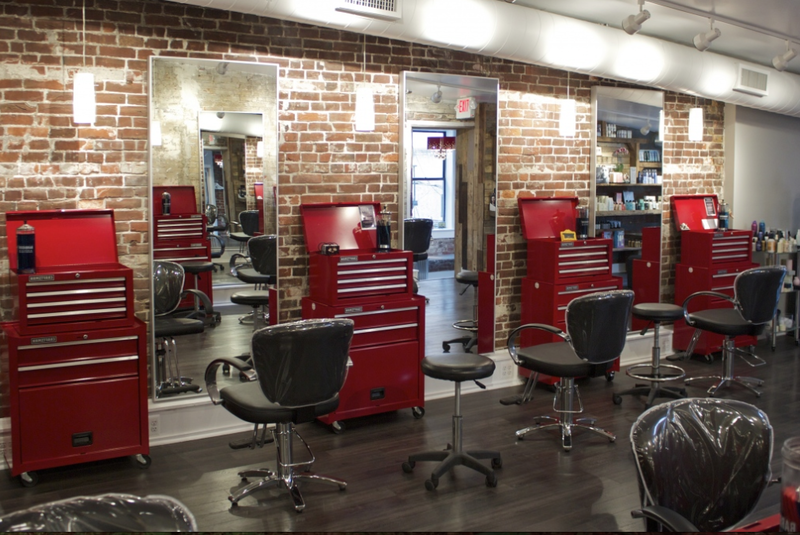 When Jen Eberwein first opened Crimson Hair Studio, she knew that the design and location of her beauty salon was extremely important to the success of her business. By adding an extremely talented staff and amazing products into the equation, Jen was able to not only build, but expand her business! 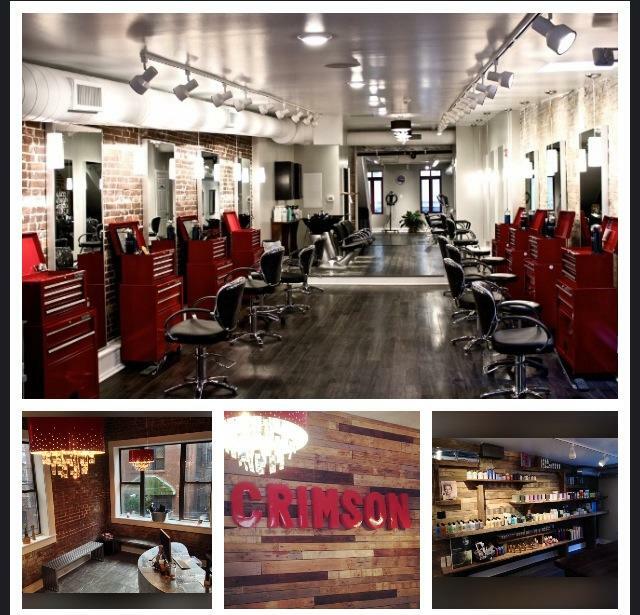 The original location, on 16th Street, between Pine & Spruce, was the perfect start to build Crimson, but all the stylist’s expertise gave Crimson a growth spurt; the team soon outgrew their space. are. 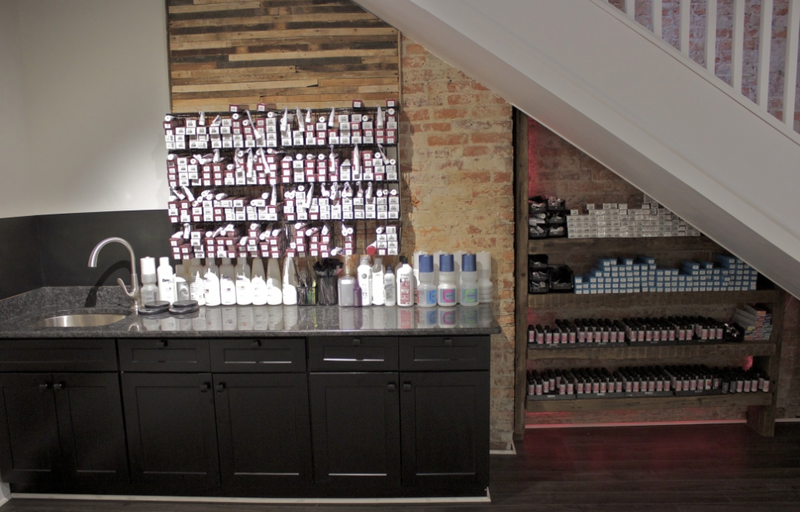 The classic motif of “Movin on Up“ refers to the few blocks that allowed the business to jump zip codes, as well as the second floor loft space; very few city storefront locations offer the extended space that Crimson’s studio feature. 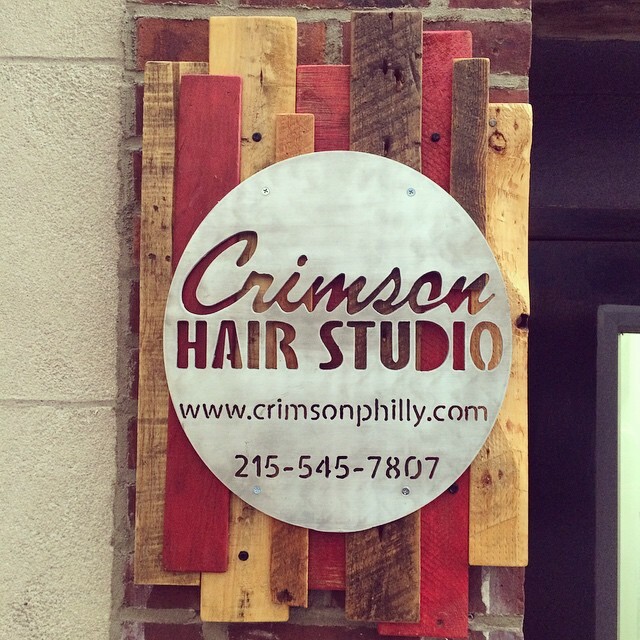 Located on the 1700 block of Sansom (between 17 & 18, Walnut & Chestnut), Crimson Hair Studio’s door is marked with their custom wood sign, above the dial up box; dial 001 and you will be buzzed up. Crimson’s sign is characteristic of the reclaimed wood wall claddings that bring a naturalistic element to the industrial loft. Wood and metal, brick, marble and glass set the perfect tone for your style experience. Crimson’s elemental aesthetic was designed with the inspiration of Anna and her team at Busybee Design. Natural light, as well as modernistic chandeliers that resemble rough cut jewels set a glowing tone. 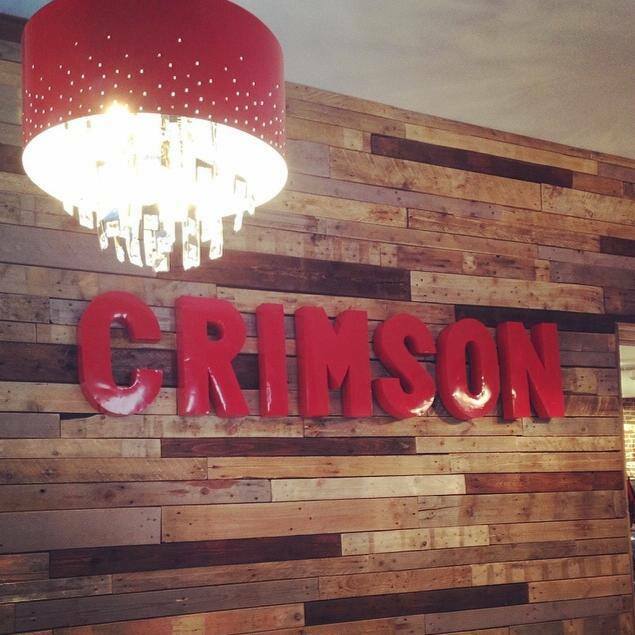 The reception area welcomes you with red reclaimed tin letters announcing “CRIMSON “ and a riveted metal desk. 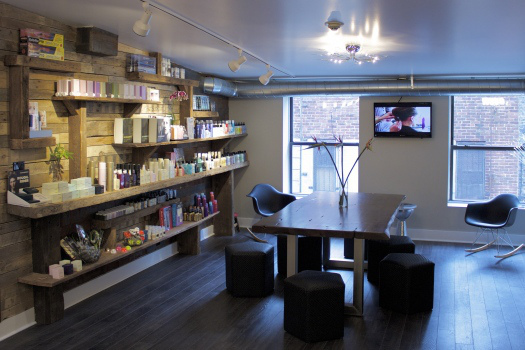 Jen was especially interested in featuring a client seating area in the loft. “The large, light space is so great for bridal clients and their wedding parties; it’s important that there be a special spot to host the group’s needs.” The seating area features a long wooden table with seasonal tablescapes. Leather and wood stools and benches encircle the table and create ample seating arrangements. Crimson encourages all clients to use the space and offers light beverage and snack service to all their clients, as well as the opportunity to have lunch catered if hosting a party. Feel free to bring in a bottle of champagne for wedding morning mimosas or birthday salon day! Adam Made It, a local wood craftsman, clad accent walls in reused pallet planks, as well as built a wooden wall installation for the retail shelving from reclaimed barn wood. 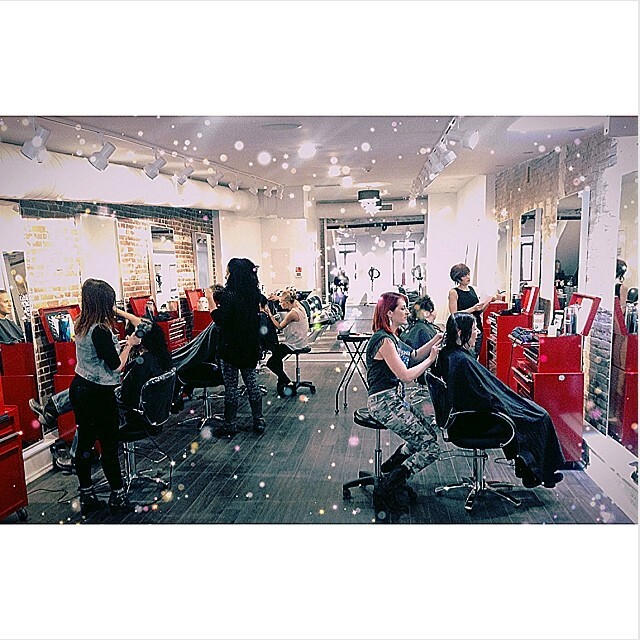 Crimson Hair Studio designed and built the space to express your personal, beautiful style.